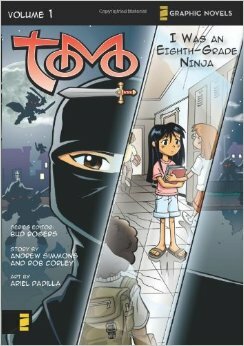 I Was an Eighth-Grade Ninja is about a girl named Hana who has to move from Japan to the United States after her mother died. She lives with her grandfather and trains with him in his martial arts studio. She meets a new girl who is really nice to her, but the girl's friends don't like Hana. The friends are planning to make Hana regret ever coming to California. How will Hana be able to keep her new friend. I really liked that Hana is already good at martial arts, so that when she trains with her grandfather, she is kind of like a superhero. She already knows all the patterns and how to fight with all the weapons. I also like that Hana seems like she is a regular girl but she is really a ninja. I also like Tomo, a little raccoon-ish creature, that is Hana's grandfather's best friend.